We can design your website from scratch, or pick up where somebody left off -- both ways are common. Click on a thumbnail below to load a portfolio piece. Click here to browse our website redesign portfolio. We just launched healthpragmatics.com for a Boulder local public health consulting firm. This site is built on the WordPress content management system with a from-scratch, custom front-end design. The site features and integrated blog and custom project templates. We just launched flxxrainwater.com, a new product line website for Front Range Precast Concrete. 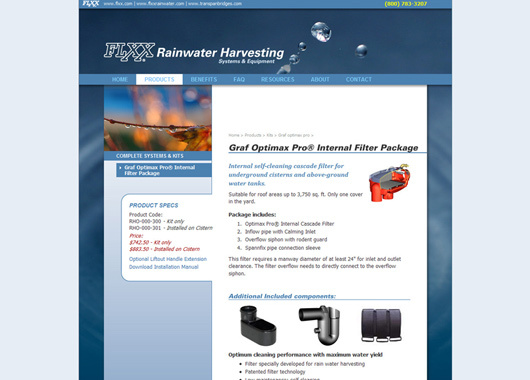 The site showcases all of the rainwater harvesting systems and equipment now offered by FRPC. We designed the site in Adobe Illustrator, built out the site in Adobe Dreamweaver and transferred control to FRPC for in-house management via Adobe Contribute. 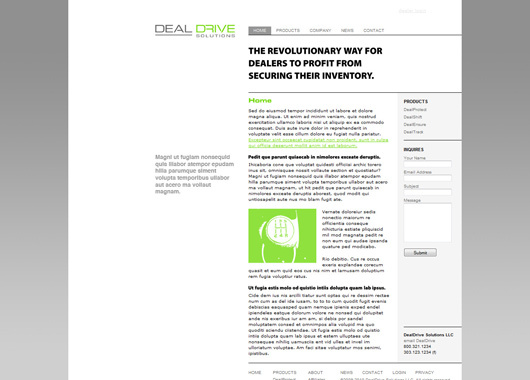 In the fall of 2010, we finished the layout design and skeleton site for DealDrive Solutions, an auto-industry insurance and liability provider. Site is awaiting final content. 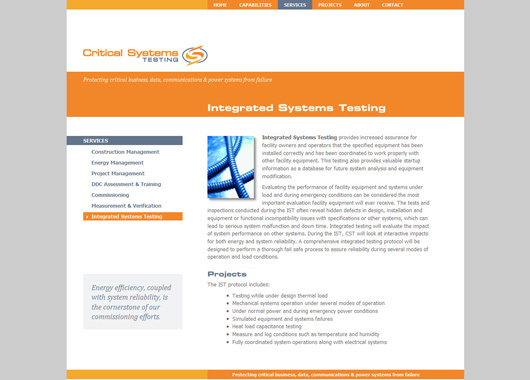 In addition to the new branding package, we designed and launched the CST website to showcase the range of systems testing services that they provide. 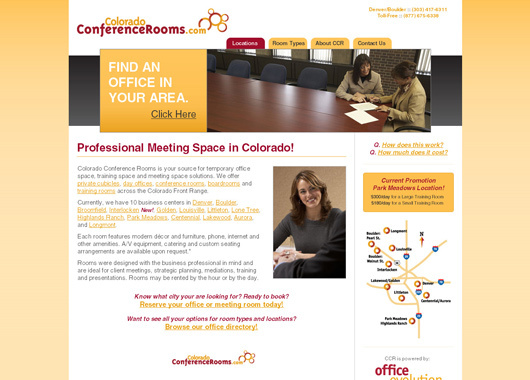 In the summer of 2008, we designed the logo/brand identity and the website for Colorado Conference Rooms, a sister website for OfficeEvolution. The site is a robust, business-modern website targeted for business professionals in search of meeting space. The site is driven partially by a custom CMS and database. 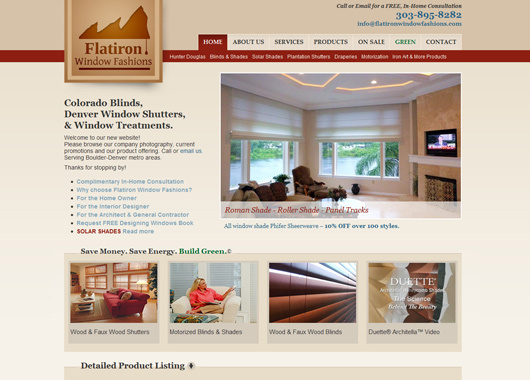 We formally launched FlatironWindowFashions.com for a Boulder-based company specializing in Windows & Blinds. 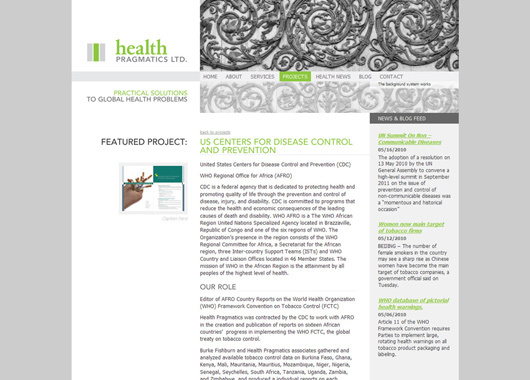 For this site, we implemented the Adobe InContext content management system to allow the client control over most content text across the site. Seen plenty of samples? It may be time to complete the web design bid request form.